Gastric Bypass Dallas, Texas | WLS Surgical Associates, P.A. 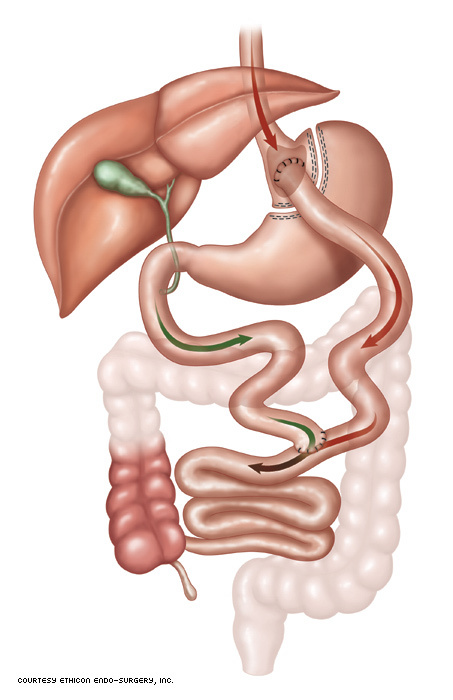 The gastric bypass procedure is widely considered to be the gold-standard of bariatric surgery because of its exceptional results and safety record. Unlike gastric sleeve and gastric banding, the bypass procedure combines restriction by cutting away part of the stomach with malabsorption by blocking caloric absorption through the small intestine. This combination results in the greatest short and long-term weight loss of any bariatric procedure we offer. During this procedure, Dr. Jeff Henke bypasses approximately 95% of the existing stomach, leaving only a small pouch the size of a golf ball, and therefore restricting food consumption. The portion of the stomach that is removed also produces the hormone ghrelin which regulates the feeling of hunger. With most of this hormone eliminated, patients will not feel as hungry and will therefore eat less. The second part of the procedure involves moving a portion of the small intestine, attaching it to the newly created, small gastric pouch. DIABETIC (ON INSULIN OR 3 ORAL AGENTS). Most patients will leave the hospital off of all of their diabetic medication. This one fact makes the Lap Bypass the preferred operation for the diabetic patient. SEVERE REFLUX (HEARTBURN). If you have severe acid reflux that requires nightly medication and you have complications from that condition (narrowing, ulcer, asthma, or pre-malignant changes), then the Bypass is the preferred operation, since it immediately closes off the acid and bile from the lower stomach. SEVERE OBESITY. (BMI > 50-55). The more weight that a patient must lose, the more likely that they will be successful with the Bypass procedure. CHRONIC ANXIETY/DEPRESSION. If you are on 2-3 anxiety or depression medications, then you will likely do better with the Bypass, since the Gastric Band requires more dietary control on a meal to meal basis. If you are chronically stressed about family, work, etc, you are more likely to eat around a Band. Most gastric bypass patients will lose around 75-80% of their excess weight at 1 year. Someone who initially weighed 250 lbs and their ideal weight was 150 lbs, would typically lose 75-80 lbs. Nearly everyone will regain 5-10% due to the following causes where they adapt to the bypass and they fall back into bad habits. Most people will stabilize at around 70% excess weight loss. That is success!! DRINKING WITH MEALS. Remember, this allows for food to be washed down the intestine, allowing you to eat more food. You must not drink for 30-60 minutes after a meal. EATING HIGH CALORIE SNACKS which are high in FATS like: nuts, crackers, chips, cheese, sunflower seeds. One handful of nuts might be 1/5 of your daily calories. This is also called Grazing, since you can eat these comfortable foods, but add far too many calories. EATING SOFT COMFORTABLE FOODS. It is very common to mostly eat soft foods that go down easily, without much restriction. However, we want you to eat foods that go down with difficulty!!! Eat meat, bread, rice, and other foods that you have tended to avoid because they made you feel uncomfortable. It is normal to avoid hard rough food that goes down with some difficulty, but avoiding foods that go down quickly, allows you to overeat. These are all common and very easy to correct! Simply avoid drinking with meals, avoid snacks, and eat tough, rough food that get you filled up fast.